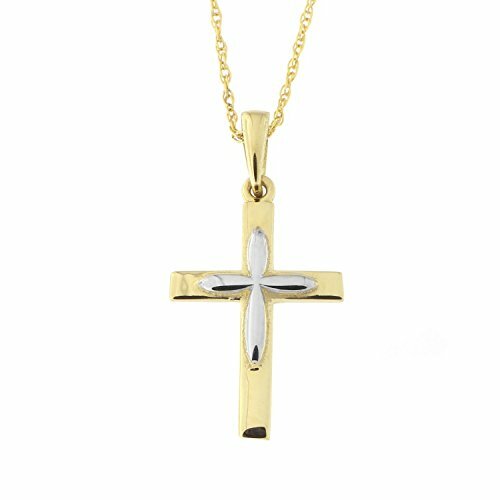 Beauniq 14k Yellow and White Gold Layered Cross Pendant Necklace, 18"
This necklace is made of solid 14k gold (not plated, bonded or filled) and stamped "14K " (585). The necklace is a delicate and feminine thin rope chain with a spring ring clasp. This necklace is simply elegant, coordinating with every outfit and suitable for every occasion. The pendant measures 10mm (0.39 in) x 15mm (0.59 in), the weight of the pendant is 0.5g, the weight of the 18" necklace is 1.1g, the chain is 0.8mm thick and either 13, 15, 16, 18, 20, or 22 inches long. This necklace is made of solid 14k gold (not plated, bonded or filled) and stamped "14k". The pendant measures 10mm (0.39 in) x 15mm (0.59 in), the weight of the pendant is 0.5g, the weight of the 18in necklace is 1.1g, the chain is 0.8mm thick and either 13, 15, 16, 18, 20, or 22 inches long.